Throne of Lies is a social deduction game, also known as a Werewolf/Mafia game. Sixteen players are randomly (and hiddenly) assigned a class and are placed in one of three factions. Once the game begins, it is up to each player to use their best instincts to figure out who should live and who should die in order to achieve victory. 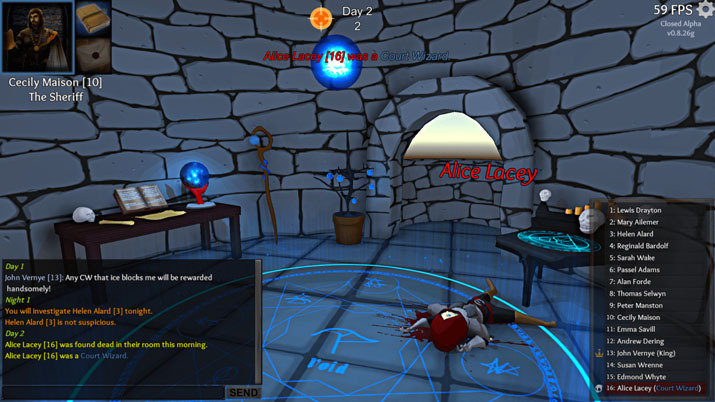 If you have played any other games of this genre, such as the popular title Town of Salem, Throne of Lies immediately feels familiar. Unlike other games of its genre, Throne features 3D graphics, over forty classes, and a ludicrous amount of abilities. Such great promise begs the question, is Throne of Lies a great spin on a familiar game type — or is it too cluttered for its own good? Never having played as the reaper, I scanned my abilities page. The goal was simple: collect souls and use souls to collect more souls. The catch? Anyone who I reaped during the night would be an empty shell the next day; appearing alive to the crowd while actually dead. A group of players had chosen Harry Potter-themed names, the rest chose familiar names in pop-culture and other popular games. I knew I had to destroy Gryffindor. After reaping two helpless victims without a shred of blame directed at me, I knew it was going to be too easy; I needed a gimmick! I began choosing my victims far in advance, drawing pictures of them on my deathnote. Each victim revealed my next victim to the rest of the players. Potter panicked in the chat as pictures of Hermione and Ron suddenly featured bold red X’s. I decided to throw a curveball due to the others flocking to protect Harry. I erased his picture from the note entirely. Everyone was shocked as they saw that Harry had been replaced with a crossed out photo of Captain Crunch. Eventually, the match came down to three of us, the alchemist being the undecided execution vote. Who would he choose? As my opponent attempted to make his case, I used an ability to silence him, making him look especially guilty. As he was executed, the poor alchemist had no idea as to what he had done. [EN: Who does that anymore?] As someone who is familiar with the genre and has fifty hours recorded in Town of Salem as of October 11th, 2017, my jaw dropped upon seeing how many classes and abilities are featured in Throne of Lies. If you’re going to lie, you need to know what you’re talking about. Newcomers to the genre, let alone the game, may be discouraged by the amount of studying needed to really get a handle on the title. Have no fear, if you happen to forget anything, a guide is always available in-game with an efficient summary of each class and faction. One of the more notable distinguishing features of Throne of Lies is its 3D design, unlike the games that came before it, which were typically text-based or 2D. Is that necessarily a good thing, though? To put it simply, not yet. The player models and animations are extremely rough and look unfinished. The executions are unsatisfying and the blood looks like a cheap green screen effect. I am only criticizing the character aesthetics this harshly because the environments look great! The shading is unique and the design of your home, which is based on your role, always feels appropriate. Sitting on a throne as the reaper is empowering and being jailed feels intimidating. Each environment serves its purpose, so it’s a shame that the characters are so poorly done in comparison. The user interface, on the upside, is fantastic. 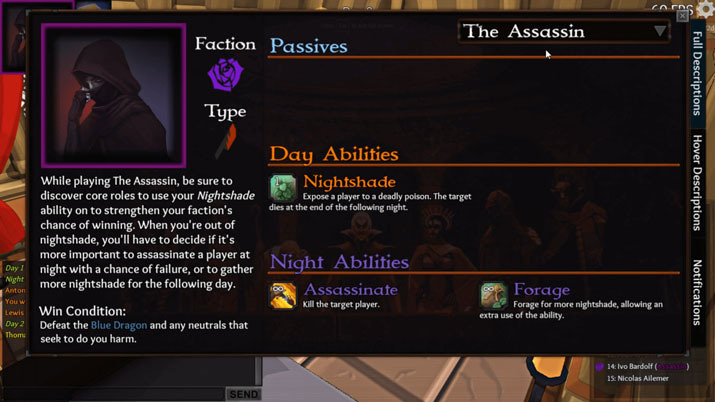 The text in the chat and miscellaneous tabs is color-coded, meaning that checking something such as a dead player’s faction simply takes checking for the color of their name. The one minor complaint I do have is that the journal currently overlaps the chat, resulting in important details often being covered up. Needing to click back and forth in order to take notes occasionally isn’t the end of the world, but is definitely an inconvenience. So? What’s new? And where’s the action? Throne of Lies comes with a plethora of roles. It includes all the familiar roles that veterans to the genre have seen, such as the “Prince,” capable of jailing others, or the “Observer” who must investigate other players to reveal their alignment. Throne has added many more roles, however, such as — my favorite — the “Reaper.” Reapers have one goal; kill everyone. The more you kill, the stronger you get. The game also focuses on an elected King who can belong to either faction, so don’t be so quick to place all your trust in him. The King’s heavy influence can easily sway others to kill any player he sees fit. Another impressive mechanic which has been incorporated into these factions is the ability of ‘evil’ factions to convert other players to join them. If they’re not stopped quickly, they’ll continue to infect the table until there’s no one left to oppose them. Werewolf/Mafia games typically suffer from the same issue: misfortune strikes, you’re given a minor role, and now you spend twenty minutes reading while feeling like you hold no true power over the game. Imperium42 (the developers) wash this away to their best ability by making sure that a majority of the roles in the game have abilities for both day and night, along with multiple abilities for each. The removal of this strict role ability lock creates a much more complex, yet flexible dynamic on each match. Butlers, for example, are a distracting role, yet they’re also capable of murder by poison. More engaging roles means that more players are engaged in the experience and always plotting. The flexibility of every role means that accusations will require a lot more investigation by players in order to uncover the truth. Given that Throne of Lies encourages role playing, the experience comes down to with whom you’re playing. In my hours of playing, I’ve had plenty of games where I’m constantly wiping tears from my eyes from laughing at the hilarious chaos in the chat, and just as many games where I viciously typed as fast as I could to counter an accusation directed at me. If that isn’t enough to convince you, the ability to draw your ‘death note’ is by far the greatest addition. Even when murdered right before unfolding my master plot to win a match, I couldn’t help but laugh as my showcased dead body was followed up with a picture of a crudely drawn fuzzy monster with a “>:|” face. I have yet to break out of my habit of being completely silent during the day when given the ability to draw death notes. Throne of Lies is yet another addition to the very specific social deduction genre. Players unfamiliar to the genre will definitely realize very quickly whether it is for them or not. Throne requires time and patience to get the best experience. For those who don’t mind doing a little bit of homework before starting a game, Throne is a great experience which raises the bar for the genre. The developers, Imperium42, are obviously passionate about their game and its community, immediately offering a link to their Discord on launch. As long as they continue their engagement with their community — and release a steady flow of updates to polish the rougher aspects of the game, I could easily see Throne garnering a higher score; the title shows real promise of eventually being the poster child of its genre.